The Henkelman Boxer 42 with ACS controller as standard is a modern tabletop model with a full range of vacuum, HCCAP and MAP packaging options. It has user-friendly digital program and maintenance functions, allowing easy use of the full product. Items sealed in a vacuum bag will have a longer shelf life, optimal hygiene and no contamination of the product. The sealer hermetically seals the bags, preventing any bacteria entering, the loss of moisture and mold growth. 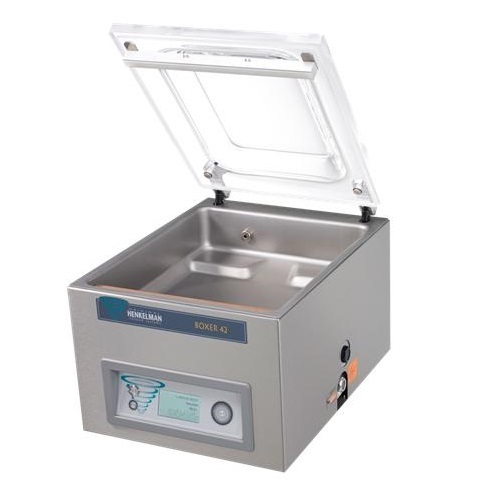 The value of the product is sure to be prolonged when vacuum-sealed with the Henkelman Boxer 42. Professional vacuum packaging for a very attractive price. The Boxer 42 is the perfect machine for efficient cooking concepts like Sous-Vide and Cook & Chill. Optimal packaging contributes to food safety and HACCP standards. Intuitive interface which is easy to program and understandable thanks to its fully animated functions. Standard sensor control. Special integrated functions such as sequential vacuum, red meat and external vacuum are easily activated. Easy and fast programming on a computer (up to 100 labels and 20 programs), which can easily be transferred on the machine via USB. Guaranteed traceability and controllability with 5 operator access codes. (Automatic storage of: active operator, packed product, amount of cycles, settings, time and date).Henkelman has developed a special software to easily program this display. You can ask your local distributor for this program.